Pear Pineapple Pie Filling - Canning Homemade! I seem to write much less these days about the process of canning and how good it feels to be in the kitchen. I love the inspiration coming from so many of my followers and just when you think you have seen everything someone comes up with an another fantastic spin on a recipe. Terry who has been with me for a few years asked about the combination of pears and pineapple in a pie filling. I hadn't thought about it since pears are such a subtle fruit that maybe the pineapple would be too overwhelming, but apparently not! Terry shared with me her great recipe for a Pear Pineapple Pie filling. It can be used as a conventional pie, but I'm thinking hand pies, crumbles, even a filling for a puff pastry. Here is Terry's recipe and photo of this amazing alternative to Pear Pie filling. Thank you Terry for sharing your variation and your photographs of your processed jars. Preparation: Wash, peel, and core pears. Prepare slices 1/2-inch wide and place in water containing ascorbic acid to prevent browning. Boil water and add each batch of pears for 1 minute after the water returns to a boil. Drain but keep heated fruit in a covered bowl or pot. Cooking: Combine sugar, Clear Jel® and spice in a large kettle with water and apple juice. Stir with whisk and cook on medium high heat until mixture thickens and begins to bubble. Add lemon juice and boil 1 minute, stirring constantly. Remove from heat. 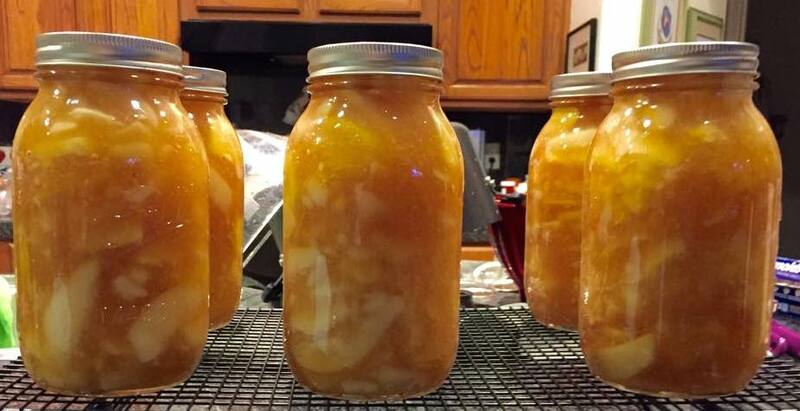 Fold in drained pears slices and Pineapple and immediately fill hot jars with mixture. Filling: Note: It works really well if you add some to the jar through your funnel and using your plastic spatula to push down the filling and remove air bubbles as you go up the jar with each scoop. Fill to 1 ½” headspace. Adjust headspace if needed. Wipe rims of jar with a dampened clean paper towel. Adjust lid and process immediately. Processing: Process in a water bath canner for 25 minutes at a full rolling boil. Wait 5 minutes, remove and place on dishtowel overnight undisturbed. The next day remove rings and clean jars and label with recipe name and date. Store in a cool, dry, and dark place. This recipe will make 6 - 7 quarts.